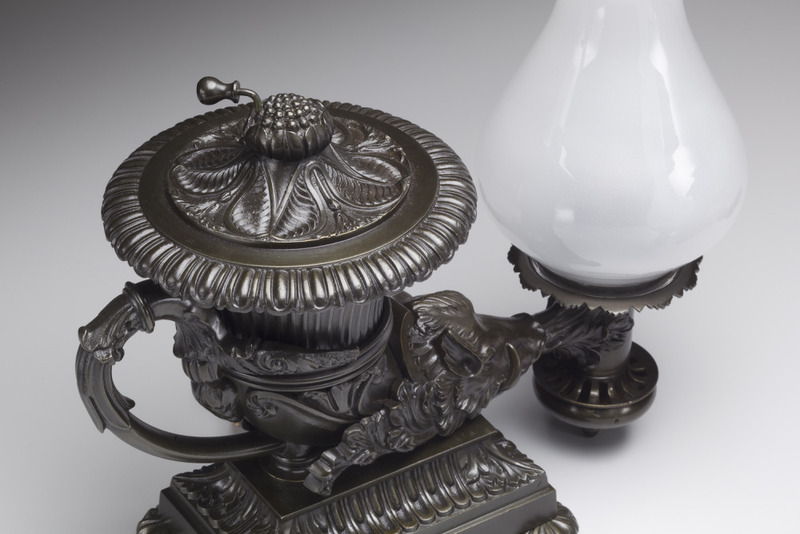 The round top of the oil font with lotus leaf cast decoration and finial on the fluted, horn-shaped font and curved integral handle, tapering to a boar’s head, the boar’s mouth issuing the fuel tube terminating in the vertical burner tube with intake vent and shade and chimney holder, all raised on a molded base on four molded feet. 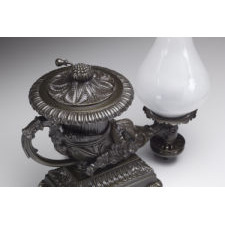 Condition: Excellent: bronze surface and burner tubes restored, glass shades and chimneys are modern reproductions, electrified. 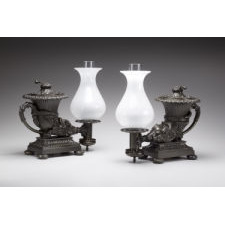 The firm Thomas Messenger (1767-1832), began in 1797 with Thomas Phipson was to become the most important manufacturer of oil and gas lighting of the 19th-century. Listed initially as: “Brass Founders, Manufacturers of Church Candlesticks, Patent Lamps, Etc.” their successors were to survive into the 1920s. Their partnership lasted until 1823, the year after they opened a London office at 21 Grenville Street, Hatton Garden. For the next two years Thomas Messenger is listed in London city directories alone and then in 1828 with his son Samuel as “Thomas Messenger and Son” at the same address. After Thomas’ death in 1832, the firm became known as “Thomas Messenger and Sons” continuing at Hatton Garden, London and Broad Street, Birmingham into the 1860s. This invention, developed initially with Matthew Bolton and James Watt in England, was subsequently manufactured by a host of makers in Birmingham including Messenger, Johnston-Brookes, Phipson & Lambley, Fletcher & Day and Ratcliff. Hailed by Rees in his encyclopedia of 1819 The Universal Dictionary of Arts, Sciences, and Literature saying "it may be justly ranked among the greatest discoveries of the age" and by Benjamin Franklin who noted it was "much admired for its splendor," Argand's invention was the most important advancement in home lighting since the discovery of fire. The design of these lamps, like many Classical Argand lamps, were inspired by ancient Greek and Roman urns and bronze vessels. The work of Giovanni Battista Piranesi was a rich source of inspiration for early 19th-century designers currying to the tastes of a populace fascinated with ancient cultures and focused on the electrifying, on-going archaeological discoveries in Southern Italy. Piranesi published two books that were particularly influential: Diverse maniere d’adornari i cammini in 1769 and in 1778, Vasi, candelabri, cippi, sarcofagi…. In the latter volume of engravings, Piranesi illustrates several Greek drinking vessels and many oil lamps including a rhyton with a goat’s head on the title page to volume II showing an ancient bas-relief in the portico of S.S. Apostoli. The present lamps with boar’s heads were clearly inspired by two engravings in this volume of the sepulchral monument to Augustus Urbanus on the Appian Way in Rome; a plate dedicated to Henry, Earl of Lincoln. A closely related boar’s head rhyton Argand lamp is in the collection of the Leeds City Art Galleries (Temple Newsam), one of a set of four ordered from Messenger and Sons by the Duke of Newcastle, the Earl’s nephew, on his visit to Birmingham in 1838. A pair stamped by Messenger is in the Birmingham Museum and Art Gallery and another almost identical pair is in the collection of the Adams National Historic Site, Quincy, Massachusetts. Gerald T. Gowitt 19th-Century Elegant Lighting (Atglen, Pa., Schiffer Publishing Ltd., 2002), p.125-132. 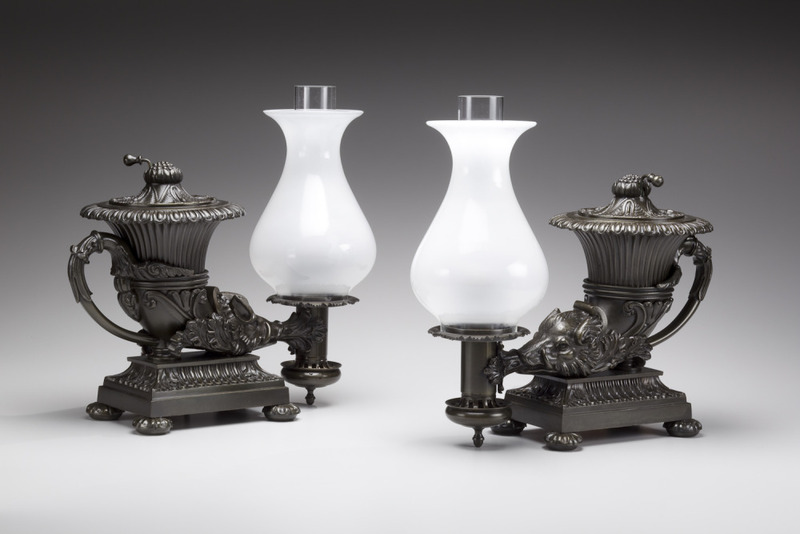 Country House Lighting 1660-1890 (Leeds City Art Galleries, 1992), p. 145-6. Wendy A. Cooper Classical Taste in America, 1800-1840 (Baltimore Museum of Art, 1993), p.159.